This radioactive metallic element was created by bombarding americium with alpha particles. 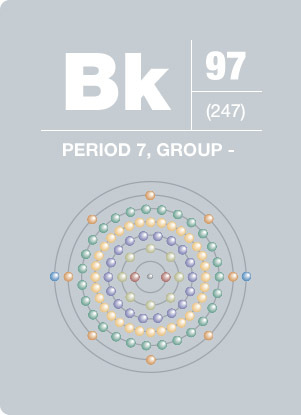 The fifth transuranic element to be synthesized, berkelium was discovered late in 1949 by Glenn T. Seaborg, Stanley G. Thompson, and Albert Ghiorso, who produced it by bombarding americium-241 with alpha particles in the cyclotron of the University of California at Berkeley. Berkelium metal is chemically reactive, exists in two crystal modifications, and melts at 986K. Like other actinides, berkelium accumulates in skeletal tissue. Outside of basic research, this element has no known uses.